From a leading clinical psychologist who has counseled couples and individuals for decades, a wise, radical, and optimistic approach to marriage that promises compatibility between an individual’s development and the often relentless demands of a relationship. People today are trying to make their marriages work over longer lives than ever before—for their children’s health and well-being, and for their own. Indeed, among the college-educated, divorce rates have declined. But staying married isn’t always easy. 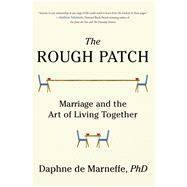 In the brilliant, transformative, and optimistic The Rough Patch, clinical psychologist Daphne de Marneffe explores the extraordinary pushes and pulls of midlife marriage, where our need to develop as individuals can crash headlong into the demands of our relationships. Intimate and sometimes gritty, The Rough Patch is an essential, compassionate resource for people trying to understand “where they are” on the continuum of marriage, giving them a chance to share in other people’s stories and struggles. With humor and deep seriousness, de Marneffe helps men and women understand themselves in order to move in the direction we’re all trying to go: a life lived with integrity, vitality, and love.